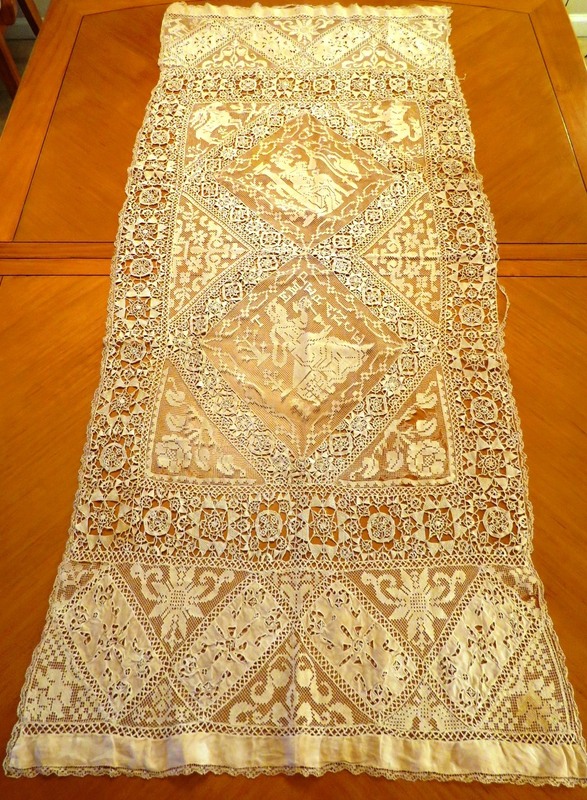 Here is a beautiful antique French handmade lace table runner centerpiece textile panel. The handmade lace table runner features elaborate detailed Reticella needle lace work and figural filet lace. The antique lace table runner centerpiece textile panel has exquisite handmade filet figural inserts and needle lace work. Both borders at each end of the antique runner table textile panel features different figural filet lace images of animals and floral and geometric designs. 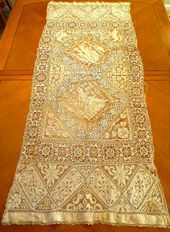 Throughout the antique lace table runner centerpiece textile panel are figural filet lace images of women and animals. The Reticella needle lace work is very detailed and is throughout the antique runner table textile panel. There are small embroidered linen insert panels. Antique French Lace Runner centerpiece textile panel Measurement: 54" x 23"
The antique lace table runner centerpiece textile panel was purchased from France. The antique lace table runner centerpiece textile panel is in good overall condition for its age. There are some breaks and holes to the antique table runner centerpiece textile panel. This is mainly to the filet lace towards the bottom edge and the tiny lace edging around the antique table runner panel. Please view the photos where I have identified where the breaks and holes are. There is some age storage staining and some faint brownish marks (see photos). It is in "as found condition" and I will leave the cleaning of the antique table runner centerpiece textile panel to the buyer to complete. For shipping: The antique table runner centerpiece textile panel will be folded to keep the shipping cost low.